Wyllow (Sahara) Ravenscroft plays bouzouki and guitar and is the lead singer for Ghazaal Beledi, singing in Arabic, Hindi, Greek, Romany, Spanish, Italian and occasionally even in English. She began playing piano at age 8 and guitar at age 13 and performed in the folk music group High Fidelity through her college years in Texas. Wyllow also plays Irish pennywhistle and old-time banjo. 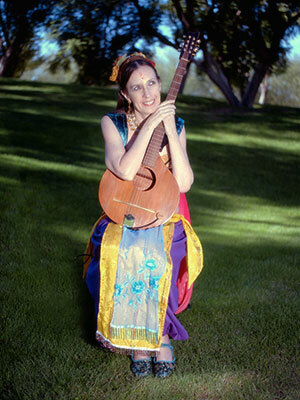 She and her husband, Kevin, formed the Celtic and English music duo Rossettistone in Tempe, Arizona. Wyllow also performed with The Singing Muses, a women's a cappella trio/quartet, at Renaissance Faires in Southern California. Wyllow joined the Black Wren Morris dance troupe, whose head musician, Jeremy (Jeremiah) Cheek asked her to join the newly formed Ghazaal Beledi band in 2008 to play at the 2009 Arizona Renaissance Festival. Since then, Wyllow has pursued her world music education with her guitar and Irish bouzouki in hand. As a member of Ghazaal Beledi, Wyllow is working on fulfilling one of her lifelong artistic dreams: to have more costume changes than all the Ghazaal Beledi dancers combined.